Gorgeous dark-schemed One Pager previewing Macaw’s new “Live design Environment” application called ‘Scarlet’. The big crisp screenshots combined with the lovely multi-angled transitions really result in professional looking Landing Page. sn't it time we had a proper web design tool? Image editors served us well during the early days, but they're a hack for real web design. WYSIWYG editors are clunky, out of date and produce notoriously unusable code. We need a new breed of tool that embraces everything the web is today. We believe it's time for a Live Design Environment (LDE) and we're dedicated to building it. 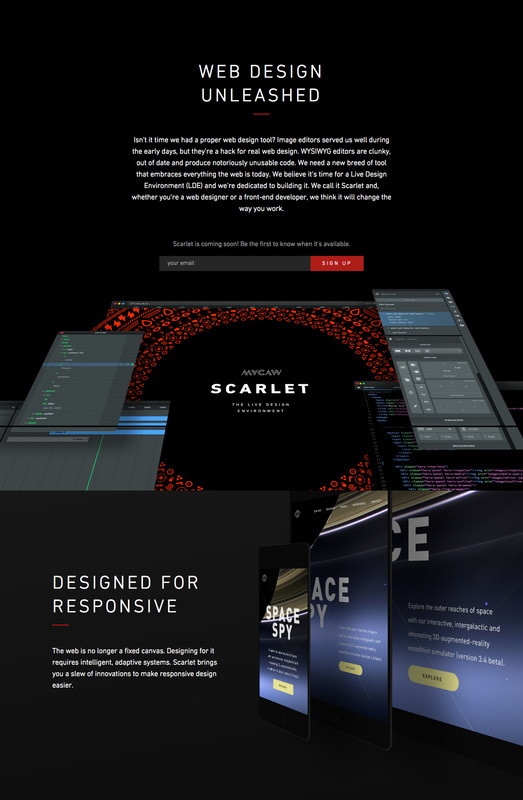 We call it Scarlet and, whether you’re a web designer or a front-end developer, we think it will change the way you work.